I crave a simple life. I for one, am just as guilty as the next person when it comes to being caught up in social networking, reality TV, forums and the brainless hoopla that goes along with living in the year 2010. I would love to just unplug… meditate… relax…breathe easy….loosen up…sit back, and actually enjoy all that life has to offer, but focusing on the simple things, and getting down to the bare bones. You know what kind of person I’m talking about…the easy going type. The one who wears flip flops, worn jeans and says things like it’s all good and no worries and actually means it. Without a care in the world, lives and loves life. Where schedules and planning go out the window and intuition and passion take over. I want that life. I would LOVE to have that life. When I think of this, one person that comes to mind is Jack Johnson. He’s SO chill isn’t he? I need to tap into his energy. 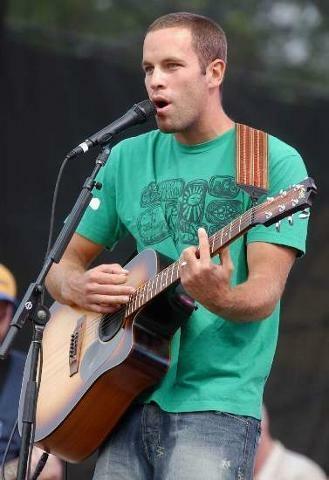 Anyone that knows me knows how much I love me some Jack Johnson music. One of my favorite songs is Banana Pancakes. A song about enjoying a rainy day and pretending that it’s the weekend and just enjoying each other’s company. I downloaded his new album To the Sea on iTunes and LOVE it. It’s a little bluesier (is that even a word?) and my two favorites so far are “At or with Me” and “From the Clouds”, but as I listen to it more, I’m sure my favorites will change. Parker and I had a good ol’ time playing and listening to some Jack Johnson. It was so much more refreshing than the typical annoying TV background noise. He was totally diggin’ the music too. A little boy after his own Mama’s heart! Maybe we can make “music” time a more regular occurrence. It beats the heck outta Sesame Street songs. I’m hoping that this new music will help channel a more carefree, easy going side me; a side of me that will be more laid back, aspiring NOT to sweat the small stuff. Me too. I’m so high strung, it’s ridiculous. I should try the music thing – I ALWAYS have the TV on in the background. Maybe that’s what makes me stressed?